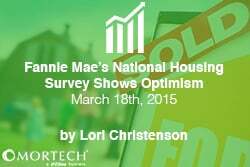 Fannie Mae’s National Housing Survey™ showed consumer optimism for the month of February with 47 percent (an all-time survey high) of those surveyed believing the economy is headed in the right direction, an increase of 3 percentage points over last month. Consumer attitudes are attributable to the strengthening in employment and optimism in the economy. “We still need to see further growth in consumer optimism toward personal finances and income for more robust improvement in housing market attitudes,” said Doug Duncan, senior vice president and chief economist at Fannie Mae. Home prices are expected to change 2.5 percent in the next 12 months, according to the survey. Only 6 percent of those surveyed said home prices will decrease, while 46 percent said home prices will increase in the next 12 months, both numbers decreasing from the previous month. As for rates, 48 percent of respondents said mortgage rates will go up, an increase from 45 percent. Down from last month, 40 percent say it’s a good time to sell, while those who say it’s a good time to buy remained at 67 percent. In the rental market, the rental price change expectation over the next 12-month period increased to 4 percent with 52 percent of respondents expecting home rental prices to go up, the same as the previous month. Those that believe it would be easy to get a home mortgage increased 4 percent to 54 percent compared with 43 percent of those who think it would be difficult, a decrease of 4 percent from last month. If they were going to move, 65 percent said they would buy while 29 percent said they would rent. The survey is given to a sample of 1,000 respondents ages 18 and up within the month of February and is conducted by Penn Schoen Berland, in coordination with Fannie Mae. The survey assesses consumer attitudes towards homeownership, renting, the economy, and household finances. The findings are then compared with the monthly findings of the same survey which has been administered since June of 2010.